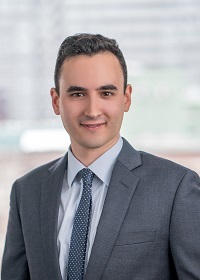 Since joining Greene LLP in early 2016, Simon Fischer has focused his practice on False Claims Act litigation on behalf of whistleblowers in health care, pharmaceutical, customs duty and government contracts qui tam cases. Before joining the firm, Mr. Fischer interned within the Affirmative Civil Enforcement unit at the U.S. Attorney’s Office for the District of Massachusetts, principally on False Claims Act cases. He also interned for the Honorable Bruce Selya of the First Circuit Court of Appeals, as well as Oxfam America, the Suffolk County District Attorney’s Office, and Altshuler Berzon LLP. Prior to law school, Mr. Fischer worked for the Senate Foreign Relations Committee and the Joint Improvised Explosive Device Defeat Organization where he helped oversee over $400 million in government contracts. Mr. Fischer received his law degree from Northeastern University School of Law, where he was involved in the school’s Prisoners’ Rights Clinic, drafting parole hearing memoranda and arguing complex parole hearings for Massachusetts prisoners serving life sentences. He is a graduate of the Boston Latin School and obtained his B.A. in Political Science from the University of Vermont. Mr. Fischer received his Masters in Sustainable International Development from the Brandeis Heller School for Social Policy and Management.